Prior to performing laparoscopic renal cyst ablation, patients must be counseled on the possibility of bleeding, transfusion, anesthetic risks, infection, urinoma, adjacent organ injury (e.g., bowel, adrenal, liver, spleen, ureter, and renal vessels) as well as renal loss. 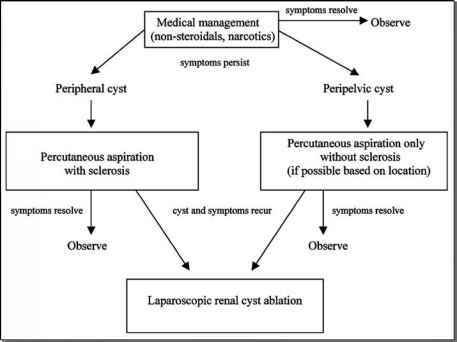 Patients must be aware of the possibility of failure to ablate all cysts, recurrence of cysts, and persistence of symptoms despite successful ablation of cyst(s). The possibility of partial or radical nephrectomy should be discussed, especially in cases of indeterminate renal cystic lesions in which the possibility of malignancy is suspected. Patients must be aware of the possibility of failure to ablate all cysts, recurrence of cysts, and persistence of symptoms despite successful ablation of cyst(s). The possibility of partial or radical nephrectomy should be discussed with the patient especially in cases of indeterminate renal cystic lesions in which the possibility of malignancy is suspected. As with any laparoscopic procedure, patients must understand the possibility of requiring conversion to an open surgery if deemed necessary.